White paper on crime 2004 Part2/Chapter5/Section3/3. The classified treatment system was introduced in1971as a system to make effective use of probation officers'expertise in which probation officers intentionally and directly participate in the supervision of probationers and parolees,especially in the supervision of those who have grave problems with their predispositions and environments. Fig. 2-5-3-3 shows the percentage of probationers and parolees who were identified as"Class A"(those who are difficult to treat)since1989. 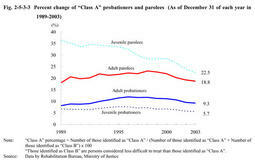 As of December31,2003,"Class A"adult parolees were18.8%and"Class A"adult probationers were9.3%. Categorized treatment is a system whereby probationers and parolees are divided according to the nature of their crime or delinquency,environmental conditions and other circumstances,and supervision is carried out focusing on the characteristics of each category.This system was introduced in1990to improve the effectiveness of supervision. Individual supervision of a categorized probationer/parolee is carried out based on the guideline and manual prepared for the supervision of each category,and in some probation offices,group treatment is implemented for the probationers/parolees or their guarantors in some categories.Since April2004,simplified urine tests have been introduced for those adult parolees who had violated Stimulant Drug Control Law,on their own volition. Special measures to enhance parole supervision are taken for long-term sentenced parolees who are to serve a sentence of eight years imprisonment or more including life-imprisonment(see Section2,3(2)of this chapter for parole examinations for long-term sentenced inmates). Intermediate treatment is a system whereby a long-term sentenced parolee is accommodated in a halfway house for a month from the release on parole,if such a treatment is deemed to be reasonable for him/her by the Regional Parole Board and he/she consents.The purpose is to provide those parolees with training for daily living and occupational support and to enable them to have a prompt and smooth return to life in the society.In2003,105parolees were subject to intermediate treatment(Source:Data by Rehabilitation Bureau,Ministry of Justice).